Bafana Bafana are ready to proudly host the biggest sporting event in World Soccer - and the world! And, judging by their performance in the Confederations Cup 2009, they're going to do more than host, but are looking to go far. 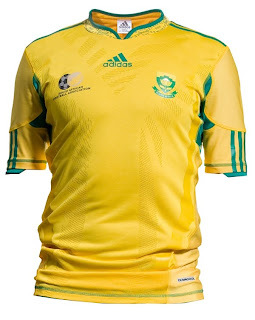 We are glad to introduce the official gear the South Africa National Soccer Team will wear for the World Cup 2010! This jersey has the traditional South African colors, along with some unique style touches, plus the added performance benefits of addias ForMotion: The innovative technology that offers maximum comfort and perfect fit, with features like three-dimensional design, different combinations of fabrics for greater flexibility and special stitching to eliminate friction during intense action. That's not all: it also features adidas ClimaCool® the advanced material engineered to reduce heat and moisture build-up, allowing increased comfort and performance – to keep you feeling fresh no matter how long you play, train and cheer on Bafana Bafana!